Prints using 3 types of ink. Print with dye transfer sublimation ink, direct print sublimation ink and water-based ink to meet your needs or adapt to changing opportunities. Intelligent Interweave print technology (i2) virtually eliminates banding. i² allows for increased print speeds and helps create breathtaking image quality. ValueJet Status Monitor (VSM) allows you to connect wirelessly. Monitor the health and status of your printer from your iPhone or Andoid Smart Phone to check for heater settings, ink levels and media end. Easy to install and operate. Mutoh ValueJet printers are well known for being the easiest printers to operate in the industry; this saves you valuable time on every project you print. Includes take-up system. You are ready to be productive right from the start. Heavy duty take-up is available. 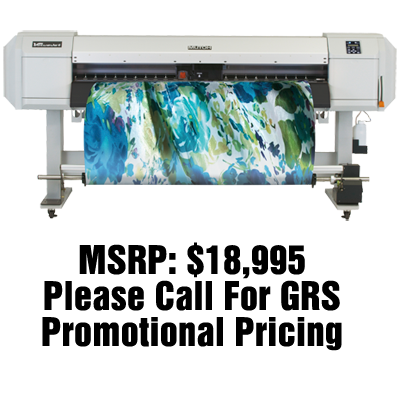 Built to last, featuring Mutoh’s outstanding craftsmanship and rugged construction. Mutoh ValueJets are renowned for being carefully crafted to rigorous standards for years of profitable use. One year on-site warranty provides peace of mind. Mutoh’s highly respected one-year on-site warranty backs up our precision engineering and meticulous production practices to give you a full-package that is a great value any way you look at it.